The TPC is a concept we find on NVIDIA GPUs. On G80 and GT200 architectures, a TPC, or Texture / Processor Cluster, is a group made up of several SMs, a texture unit and some logic control. The SM is a Streaming Multiprocessor and is made up to several SPs (or Streaming Processors), several SFUs (or Special Function Unit – the unit used for transcendental functions such as sine or cosine). A Streaming Processor is also called a CUDA core (in the new Fermi terminology). The TPC of a G80 GPU has 2 SMs while the TPC of a GT200 has 3 SMs. A SP includes several ALUs and FPUs. An ALU is an arithmetical and Logical Unit and a FPU is a Floating Point Unit. The SP is the real processing element that acts on vertex or pixel data. Several TPCs can be grouped in higher level entity called a Streaming Processor Array. In OpenCL terminology, a SM is called a Compute Unit or CU. 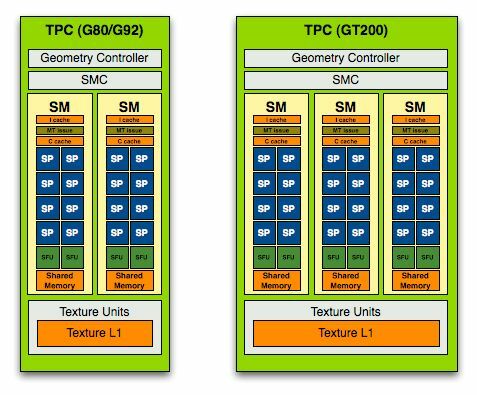 But in NVIDIA’s new GPU, the GF100 / Fermi, the TPC is no longer valid: only remain the SMs. We can also say that on Fermi architecture, a TPC = a SM. In Fermi architecture, a SM is made up of two SIMD 16-way units. Each SIMD 16-way has 16 SPs then a SM in Fermi has 32 SPs or 32 CUDA cores.